Figure. The girl’s wrinkled palms after exposure to a stream of tap water. 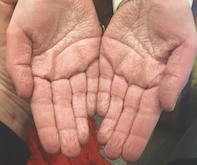 A 12-year-old girl presents with a lifelong history of rapid severe wrinkling of the skin of her palms after minimal exposure to water. The episodes are asymptomatic and self-resolve within 40 to 60 minutes after drying. Her soles are not affected. The girl’s medical background is unremarkable. Her parents have accepted the palm skin wrinkling as normal for her, but they are concerned about the appearance and wondering if anything can be done about it. On examination, before water exposure there are no gross abnormalities of the patient’s palms or other skin areas. After simple wetting of her palms in a stream of water from a tap her palms promptly wrinkle, with the formation of oedematous whitish plaques and papules (Figure). She does not complain of discomfort, pruritus or pain. After drying, her palms return to normal. This condition is called aquagenic wrinkling of the palms (AWP). Causes to consider include the following. Normal variant. Wrinkling after prolonged exposure to water is a normal physiological response driven by the intracellular absorption of water and the activation of the sympathetic nervous system, resulting in vasoconstriction and puckering of the above skin layers, which is observed grossly as wrinkling. Normal aquagenic wrinkling typically occurs after about 11 minutes of immersion.1 The rapidity of this patient’s response to a small amount of water suggests other diagnoses should be considered before settling on normal physiological wrinkling. Hyperhidrosis. Rapid wrinkling of the hands with a burning sensation has been reported in a patient concomitantly with palmar hyperhidrosis after exposure to water.2 That patient was administered a topical 15% aluminium chloride hexahydrate solution every other day and was then able to be immersed in water for up to 30 minutes without symptoms. In the case presented above, the patient and her parents did not report any excessive sweating on her palms or other areas of her body. Drug-induced AWP. Some medications have been reported to induce wrinkling of the palms on exposure to water, especially COX-inhibitors, such as aspirin,3,4 indomethacin5 and rofecoxib.6 The effect ceases after discontinuation of the drug. This patient had not been given any medications in the three months prior to review. AWP secondary to cystic fibrosis (CF) carriage. This is the correct diagnosis. AWP is characterised by the transient development of oedematous whitish plaques on the palms, namely the ‘hand-in-the-bucket’ sign, on exposure to water. It was first reported and is still primarily reported in CF patients and CF carriers.7,8 A case-control study showed that the average time to wrinkling was less in CF carriers compared with controls, and even less in CF patients.1 More recently, it was reported that the specific ΔF508 mutation within the CFTR gene predisposes patients to AWP.9 To help understanding of the genotype-phenotype correlations, a case-control study was performed and showed that patients who were homozygous for the ΔF508 mutation had the highest wrinkling scores compared with CF patients with heterozygous or other mutations.10 The molecular mechanism by which CF causes AWP is incompletely understood; however, it is thought to be related to the excessive intracellular water absorption and retention that is caused by the malfunctioning chloride channel that the mutated CFTR gene encodes. In Australia, one in 25 Caucasian people is a carrier of the CF gene. The diagnosis of AWP is based on a clinical history and physical examination. Genetic testing for CF carriage is recommended for future genetic counselling. With the advent and approval of small molecules such as ivacaftor, lumacaftor and tezacaftor that directly target the malfunctioning chloride channel that the CFTR gene encodes, it may be possible that in future topical formulations of these drugs may be applied to patients with AWP. 1. Gild R, Clay CD, Morey S. Aquagenic wrinkling of the palms in cystic fibrosis and the cystic fibrosis carrier state: a case-control study. Br J Dermatol 2010; 163: 1082-1084. 2. Seitz CS, Gaigl Z, Bröcker EB, Trautmann A. Painful wrinkles in the bathtub: association with hyperhidrosis and cystic fibrosis. Dermatology 2008; 216: 222-226. 3. Glatz M, Muellegger RR. Drug-associated aquagenic wrinkling of the palms in an atopic male patient. BMJ Case Rep 2014: 2014. pii: bcr2014203929. 4. Khuu PT, Duncan KO, Kwan A, Hoyme HE, Bruckner AL. Unilateral aquagenic wrinkling of the palms associated with aspirin intake. Arch Dermatol 2006; 142: 1650-1666. 5. Gündüz O, Ozsaraç KÇ, Ercin ME. Aquagenic palmar wrinkling induced by combined use of salazopyrin and indomethacin. Case Rep Dermatol 2013; 5: 21-26. 6. Carder KR, Weston WL. Rofecoxib-induced instant aquagenic wrinkling of the palms. Pediatr Dermatol 2002; 19: 353-355. 7. Elliott RB. Wrinkling of skin in cystic fibrosis [Letter]. Lancet 1974; 13: 108. 8. Arkin LM, Flory JH, Shin DB, et al. High prevalence of aquagenic wrinkling of the palms in patients with cystic fibrosis and association with measurable increases in transepidermal water loss. Pediatr Dermatol 2012; 29: 560-566. 9. Katz KA, Yan AC, Turner ML. Aquagenic wrinkling of the palms in patients with cystic fibrosis homozygous for the delta F508 CFTR mutation. Arch Dermatol 2005; 141: 621-624. 10. Berk DR, Ciliberto HM, Sweet SC, Ferkol TW, Bayliss SJ. Aquagenic wrinkling of the palms in cystic fibrosis. Arch Dermatol 2009; 145: 1296-1299. 11. Houle MC, Al Dhaybi R, Benohanian A. Unilateral aquagenic keratoderma treated with botulinum toxin A. J Dermatol Case Rep 2010; 4: 1-5. 12. Thomas JM, Durack A, Sterling A, Todd PM, Tomson N. Aquagenic wrinkling of the palms: a diagnostic clue to cystic fibrosis carrier status and non-classic disease. Lancet 2017; 389: 846. Dr Lee is an Unaccredited Dermatology Trainee and Associate Professor Fischer is Associate Professor of Dermatology at Sydney Medical School – Northern, The University of Sydney, Royal North Shore Hospital, Sydney, NSW.